There are so many kinds of pumpkins, but my favorite one for the soup is definitely the butternut. The sweet taste of this pumpkin gives the soup the right balance with other salty ingredients. Here are the steps how to make this creamy pumpkin soup and have healthy fall meal. Cut the veggies: onion, carrots, and pumpkin into the cubes/slices. Since you will be blending it on the end, you can shop the veggies in your own style as butternut cooks fast. 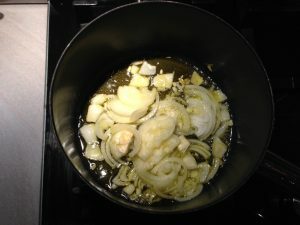 Saute the onions over the low heat until they become transparent. It usually takes me about 2 min to get them nice a glossy. 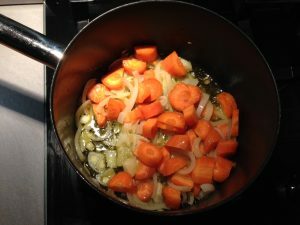 Add carrots to the onions and stir all together. Give it a pinch of salt and pepper all over. Let it all saute for 3 min and then add the pumpkin. Mix the pumpkin with other ingredients and let it absorb the flavors. 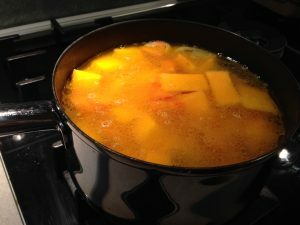 In this step, you can add 1 liter of boiling water and a cube of spices or you can use your vegetable broth. If you are looking for a good vegetable broth recipe click HERE. Cook the soup until you can pierce the pumpkin with the fort with ease. Take your hand blender and blend all ingredients into the creamy mix. You can also pour your soup into the blender and blend until smooth. Slice the hot dogs into and give them a nice golden color grilling them in your pan with some olive oil. 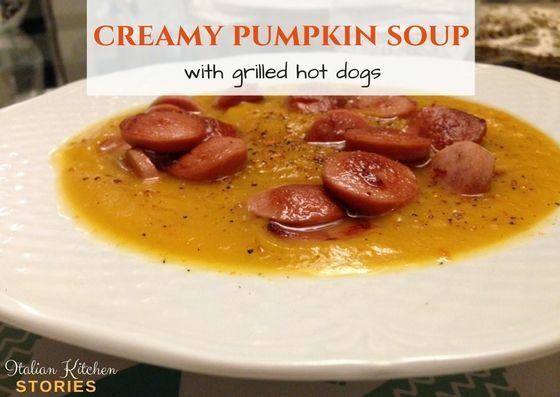 Once hot dogs have got a nice golden color, pour the soup into the bowl add them on top. Sprinkle with fresh ground pepper and red paprika flakes. 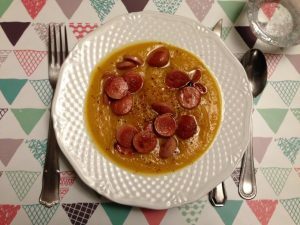 I hope you will enjoy this delicious creamy pumpkin soup. Peel and chop onions and carrots (size doesn't matter as we will blend them later on). 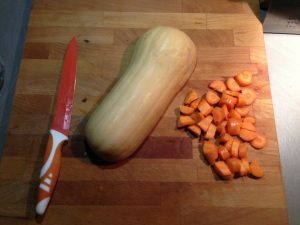 Peel the butternut squash pumpkin, clean from seeds and chop on equal size chunks. Once you have done it, set it aside for later. 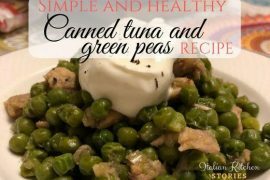 Take a large pan, add EVOO and drop chopped onions and carrots inside. Saute the them until you notice that the onions have become glassy and soft. Add the pinch of salt. 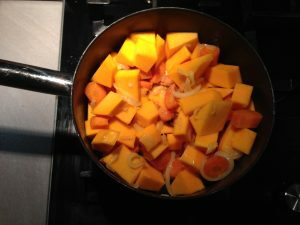 Now add the pumpkin and stir for about a minute, then add vegetable broth or plain hot water and add the veggie cube for the extra taste. Liquid needs to cover all the veggies. Let it all simmer over medium heat for about 15 minutes. Then pinch with a fork to see if the pumpkin is cooked. If the pumpkin is cooked turn off the heat and set aside. If not continue to simmer. Now take the hot dogs and slice them into circles. Place them into frying pan with 1 table spoon of oil and fry them a bit to get a nice golden color. 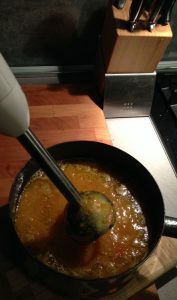 While hot dogs are being prepared take a hand blender and blend the soup into nice creamy texture. Place the soup on the plate and add the hot dogs on the top with a generous amount f fresh ground pepper.